The video is now live again from an official source, as the horse had indeed bolted. Well, there was a video published to the public, but it's now been set to private by Nintendo (as of 10:15am UK time on the day of publication); nevertheless details are below, along with a rip of the video via GameXplain. 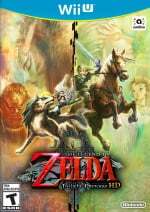 The Legend of Zelda; Twilight Princess HD will be an exciting way to kick off the 30th Anniversary celebrations for the franchise, though in recent days it's been the source of some controversy. Famitsu details of the usage of amiibo in the game, both the new Wolf Link and Zelda-themed Smash Bros. figures, has caused plenty of debate. Thankfully, at least in the interests of clarity, there's an official trailer that succinctly explains the features - it's been published by Nintendo Deutschland. It shows that the Wolf Link amiibo doesn't so much unlock a 'dungeon', but rather a challenge area - the 'Cave of Shadows' - that varies in terms of the enemies it presents. It also confirms the roles that Link, Toon Link, Sheik, Princess Zelda and Ganondorf amiibo play, showing off the - optional - buffs or increase in difficulty they offer. It seems all of the amiibo, ultimately, either give optional assistance or - in the case of Wolf Link - add a challenge area with further boosts. We can, of course, simply not scan them if we want to experience the game as it was originally designed. All those that got their knickers twisted,you can untwist them now. @ThomasBW84 The video is private now.I'd guess it wasn't meant to be shown yet? You still need to prepare yourself for complaints like "that's it!? The amiibo contents don't justify the price! amiibo preorder cancelled!" Also Nintendo Direct confirmed within this week or next? Read the article with a smile and clicked the video with glee. Game Xplain have the trailer up on their Youtube channel. Game is looking better! Can't view the video......message says its private. If these are what a previous article called rumours, then is this now official or is this yet another rumour? It is the association of toys and Nintendo's flag ship games that are off putting and ultimately damaging to the franchise. You can't have this both ways. If there is extra content, all be it rubbish content, then the buyer does not get the full content without the toy. If the content is rubbish then the reviewer should make this clear in the review. Although I guess most of these toys are purchased for the collecting side of things rather than the gaming. Very happy! Big box pre-order is cancelled and going with the regular version. @Splatburst Haha yep,I think that's inevitable. @SBandy Just watched that,it's looking great.There's a comparison video there too.It's pretty clear to see this isn't just a "lazy remaster" as many have called it..
Another case in point people blowing things out of portion when it comes to Nintendo. Wait till the facts come out before setting fire to things. Yeah I don't think a direct is happening this month. @zool Well the fact that the title of the article says "Official Nintendo Video" is a big enough clue that it isn't another rumour.It obviously wasn't supposed to go live yet so it's been made private.Gamexplain have the video up still though.The amiibo extra is just a challenge mode similar to Splatoon's.I doubt that it will be rubbish like you say.It's just a little bonus for those who spent the extra money and bought the amiibo.Those who are not interested in amiibo are getting a remastered classic at a budget price.I have Splatoon but don't own any of the amiibo,I certainly don't feel like I'm missing out on much though.The extra modes they unlock are probably fun but short experiences,but not really nothing worth bothering about if you're not interested in collecting amiibo. @Splatburst Lol you save 10 going digital been to game stop site.pre-order only has bundle,Amazon has bundle and digital code.last time I checked 50- 60 is normal game prices lol. So you can use several Amiibo's to different things? This is a rip-off. A remake that costs over 100$ if you want all features? Not even now we know and for me it was quite the shock when Shibata said in the last direct that you can bring datas from TP to Zelda U using the wolf Link amiibo, that's the use I want clarified most! Even if to be fair I start to doubt it's gonna be anything interesting, maybe it's just gonna be a sort of record sharing, I can see a similar cave easily added to a open world like the one of Zelda U afterall. Just shows that people will rant at anything. Best part of the video: 1:10-1:13. Trailer looks nice. Got big box/amiibo and soundtrack cd via amazon uk... preorder. .. dropped to £35.85 back to full price now. Dont mind what fuctionality amiibo has for that price!! Bargain. @Splatburst Nah, this is good news. It means they aren't locking substantial game content behind an insanely overpriced physical unlock key like they did in multiple other games like Splatoon, Captain Toad Treasure Tracker, Mario Party, Animal Crossing, and Shovel Knight just to name a few of the worst offenders I can think of from the top of my head. Would have been hard for them to do so in the first place, really. Twilight Princess already exists, if they cut out content we had 10 years ago, we'd all know it and Nintendo would be buried in complaints. They can't cut stuff out this time, they have to throw in some cheap extras that don't mean anything. Oh no, I won't be able to refill my hearts once a day because I don't have a smash amiibo? Don't care, don't need a cheap "cheat code" amiibo to finish the game. Although I suppose the idea of selling cheat codes is still disgusting if I start to look at it that way. I'm going to shut up now while I'm still happy they didn't cut content out of a game we already owned to put behind an amiibo. I'm talking about the other side who likes their amiibo. I disagree with you though on amiibo. They're just bonus contents so far. Captain Toad, Splatoon ans others didn't take anything from the core game. 1up and hide-and-seek in Toad, really? Costumes and challenges in Splatoon? Not really. Mario Party? Nope. And besides, the amiibo bundles so far are 60$ the most. Which is full price of a normal game. Nothing is overpriced in the core contents. The amiibo contents are just a bonus if you like getting the amiibos. In fact if amiibo didn't exist, nobody would complain this is a 60$ game except for those who play the modded HD from emulators that runs on high-end PCs. You guys only complain because amiibo. @Splatburst I'm not bothered about the amiibo but there is no way this should be a full price game. Especially when compared to remasters on other consoles which have had significantly more work put into them. First of all, we don't know the full details on what they've improved and what they've added in this game. Second, itvis still a full game. It's up to you if it's worth full price or not. To me it ia having not played the original. And if we're basing price on contents or work they've done to a game, Xenoblade X put most games on platforms to shame. And it's only a 50$ game. Simply put, if you've already played the game or it doesn't appeal to you, then it's not worth the asking price. But for those who are interested in this remaster day one, it's worth the price. Same for other games out there. @OorWullie have you never heard of 'spin'. Put stuff out, pretend it should not go out and let folks spread the hype. DLC should be fairly priced and not reliant on expensive toys. @WebHead There is a 99,99% chance this is part of an upcoming direct. Why? Because otherwise this would have been completely in German, with a German announcer and German in-game text. Of course, leave it up to GameXplain to rip trailers and repost them. That's pretty much all they do (along with 30 minute discussions full of speculation and bad opinions). "When the going gets tough, the tough tap amiibo." This is literally one of the stupidest things I've seen recently. So, if you want HARD mode you need the ugly Ganondorf amiibo, if you want to chicken out every time you´re gonna die, you can use the Zelda/Sheik ones or if you're too lazy to kill enemies for arrows, you just tap Link/Toon Link. I mean, I wasn´t expecting mindblowing content for the amiibos, but this is so underwhelming, like, why the f*ck is Hard/Hero mode locked behing the ganondorf figurine? I am really starting to hate all these useless and overpriced pieces of cheap plastic. @FRANKLIN_BADGE I get the impression that hero mode will still be available without the amiibo but if you scan the Ganondorf one then you'll just take double damage which people would use in the games normal mode. Seems like the video is working again, at least I was able to watch it right now. Good ideas for the amiibos, they're not too overpowered so that getting the amiibos would be really mandatory, but they add functionalities that are nice to have when you got the amiibos. "don't forget the Wolf Link amiibo will function with the new Legend of Zelda game on Wii U" - glad to hear it's still coming to Wii U.
I do think the graphics have improved since first shown, and that's the best amiibno I've seen, but I don't feel the need to play almost the same game again. I'm saving that for FFVII. @wazlon Or you could maybe use it and hero mode together to receive x4 damage! An extra feature I think would be cool is the bunny hood from Majoras Mask or an option to speed up Epona when you're on horseback. Clearly the amiibo unlocks are all optional and don't detract from the experience, which is fine by me. I'm not canceling my preorder as the Wolf Link amiibo (with Midna) is still beautiful in my eyes. @faint : Yes, if you also want the cheats. So that increased damage from Ganondorf amiibo is really true. I'll admit I thought that was a mistranslation or something. Good news for masochist gamers I guess. This is almost like Kirby and the Rainbow Curse with the once a day help. Assuming Amiibo are here to stay, what type of functionality would people be OK with to justify the $13 price per unit? Hmm... I'll admit that I do like the Wolf Link Amiibo. but I can't see myself getting the Twilight Princess HD game. There's too many Zelda ports on the WiiU now. Nintendo really needs to hurry up with the new Zelda game! GAME LOOKS BETTER! MUCH BETTER!!! @OorWullie how does this change anything? It's still on disc dlc. Unless you can only use the Zelda amiibo once per game session, this is kind of cheating. @OorWullie Budget price? 50 dollars for a 10 years old game with a hd coat of paint is far from being a budget price. wow this is day 1 on disc dlc. just bad. @Moeblob It was more directed at Zool as he's in the UK.It's £39.99 for the standard version in the UK which is £10 cheaper than a full price release like Xenoblade or Smash or even Windaker HD.It's priced the same as titles like Yoshi and Kirby.Calling it a budget release was probably a bit of an exaggeration but it's still not full price release.We'll not have to pay the official price though,it'll appear on Amazon and elsewhere nearer release for around 20 to 25% cheaper.I'll be buying it digitally and I doubt I'll have to pay more than £30 for it. I'm excited about this game. I all about leaving those Amibo on my bookcase unless I'm about to die of course. I don't really remember an instance that I was endanger of dying in this game. You can try an beat your score in a cave. That's seriously lame, but whatever. I'm going to be playing this to the cow's coolata'. @OorWullie I'm glad that the price for this game seems to be better for the people in the UK, and these discounts at Amazon will certainly sweeten the deal even more. But the thing is, 50 dollars isn't a full price release in the US either, yet it's still a bit too much to ask for such an old game just because it's got remastered. The right price should've been around 40 dollars(without the amiibo of course), imo. I might still get the amiibo because I think it looks great, but I'm glad to see this content is meaningless... we already have cave of ordeals! nice! That Ganon Amiibo makes you take a considerable amount of Damage! Holy crap! I was concerned that the damage taken would only increase by x2 but it would seem its more like x10! So it's confirmed. Nintendo products will officially be subject to have day 1 DLC from now on. I'll have to be vigilant from now on. Amazing how people are okay with this, after years of the same community abhoring it and loving Nintendo for staying away from it. What about the normal Link amiibo??? Does that do anything? I preoredered the special edition... But with this maybe I'll cancel it and get the normal edition (when it goes up for preorder, of course). It will replenish your arrows. Well that's a relief. Looks like I'll be able to get the one thing I really want without buying a new amiibo. Free arrows! Still I wouldn't mind seeing costume swapping abilities with the next Zelda game. That Amiibo seems so hastily thrown together with its random rocks over the standard base. The price tag is pretty high too for a remaster. I like Twilight Princess, but I'm not really tempted here. So its just a different version of the Cave of ordeals?! @PlywoodStick Yeah, it's shocking how Nintendo die-hard fans are okay with DLC now that it's on Nintendo consoles. They used to hate it when it was a PS/Xbox thing.